I am pretty sure that there are thousands of aspirant anglers out wondering how to catch fish in a pond. They have found some place where there is a bit of water, some soft grass and maybe some shade from a tree in order to cast a line. But they now need to know to the basics. Some are obviously in desperate need to catch a fish (withdrawal symptoms), others are just yearning for a bit of peace and quiet while others desire to hone their fishing skills for future excursions to their favourite fishing locations. Whatever their respective reasons and/or agendas, they may just find some salvation in the form of small fishing ponds. #1 – What are ponds? #3 – What Features Can We Expect? It is quite a challenge to provide a short, concise description of what exactly a pond is. They can vary quite a bit in appearance, shape and depth. They can also be a natural feature or one created by man. One characteristic they all share, however, is the fact that they are closed systems, which means they are not part of a bigger lake system or a river. Some of them can be filled artificially (like the ones on a golf course, for example) while others get their water supply either from occasional downpours or underground springs. As a general rule of thumb I would say for a body of water to qualify as a pond, it would requires no more than a 10 minute leisurely stroll to cover its entire bank area. Ponds exist for a variety of reasons. As already mentioned, golf courses are some of the places you would definitely observe them. They are also created by farmers; either as water reservoirs for livestock, irrigation purposes or to prevent soil erosion. Some ponds came into existence purely for aesthetic reasons though, for example as part of urban planning by city councils by forming part of parks, “green belts” or other recreational areas. Ponds can differ both in shape and appearances, but they do share certain common features. Firstly, and as already pointed out, they are not very big. They are also, not very deep, but I am loathe to set any specific depth parameters. Suffice to say their depth can fall in a range of anything between one and three meters. Due to a general lack of water movement ponds normally have a substantial sedentary bottom enriched by all sorts of rotting plant material thereby providing a haven for all kinds of micro-organisms. Those, in turn, can sustain a wide variety of species of both vertebrates and invertebrates. Because of this rich sediment, most ponds also sustain an abundance of plant life as well, be it water lilies, water grass or reed beds with their banks covered in shrubs or trees. The ponds I have frequented in the past mostly contained either carp, bass, bluegills, tilapia or any combination of those four species. Counting amongst the more popular freshwater angling species, these angling fish seem to be able to handle pond life best. However, they are definitely not the only finny creatures capable of successfully inhabiting ponds. In previous articles I have already discussed the different tactics involved in catching both carp and bass, thus I will only briefly refer to those again. Tactics involving the deception of bluegills and tilapia do differ in certain ways, but otherwise they are roughly similar, especially when catching them with a float or bobber. For pond fishing one definitely should go short and light. For spinning and conventional fishing a rod of maximum 2 meters is more than enough. A fixed spool reel to balance said rod loaded with 4 kg monofilament will adequately complete your setup. A scoop net can also come in handy. When we are talking small ponds, the first accessory that comes to mind is obviously a float (or bobber). Now, floats come in a dazzling variety of shapes and sizes and, like most other things in life, it eventually boils down to personal preference, as far as I am concerned. Having said that, I must admit that I am quite partial to the Dutch float because of its lightness and sensitivity. 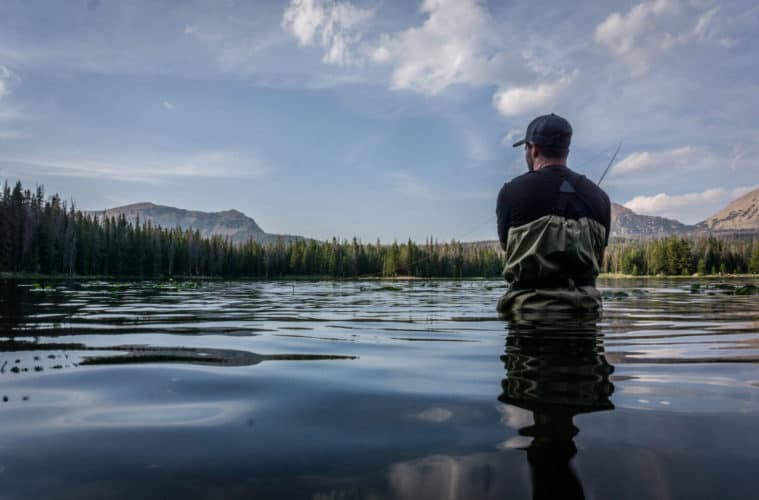 Small ponds are also ideal for fly fishing enthusiasts, because, not only do they offer the opportunity to practice an angler’s casting skills, but they furthermore provide an opportunity for the novice angler to hone his/her skills regarding fly presentation as well as different retrieves. Therefore, fly rods ranging from sizes 2 to 5 with matching reel and a floating line are ideal equipment to take on the denizens inhabiting ponds. Lastly, but equally important, is a sturdy pair of polaroid sunglasses which can dramatically reduce the sun’s glare on the water surface, because a lot of pond fishing will involve sight fishing for individual fish. The ability to detect fish quickly and effectively can play a major role in determining the success of a fishing trip. As far as baits are concerned (both natural and artificial) you obviously have quite a variety to choose from given the different quarries. For natural baits, I would recommend well-known stalwarts like earthworms, crickets and maggots. Bluegills and bass will seldom pass up the opportunity to snack on aforementioned invertebrates. Carp and tilapia are also quite partial to earthworms and both will also take bread and dough baits. Small size spinners are essential on ponds for bass and bluegills. Even tilapia will take a well-placed small spinner during certain times of the year. When it comes to flies, big streamers (tied on size 2 hooks an bigger) work best for bass. These flies need to be quite bulky and robust in order to create enough water disturbance to attract decent size fish and here my recommendation would be Muddler Minnows, Mrs Simpsons, Woolly Buggers as well as any decent tadpole imitations. When targeting bluegills I consider an assortment of small wet flies and nymphs in sizes ranging from 10 to 16 to be ideal for the job. In this regard I prefer the classics like Pheasant Tails, Gold Ribbed Hares Ear as well as any decent emerger patterns. Whenever you consider trying your hand at a bit of pond fishing, keep in mind that your mission is to try and outfox creatures that are constantly living on the edge due to the relatively small space they inhabit. They are paranoid! Just gleaning from the general description it follows that most ponds are neither very big nor very deep which inevitably leads to fish that are both wary and skittish – especially the bigger ones. On bright, sunny days fishing in small ponds can be very challenging, due to the amount of sunlight in the water. Under those circumstances it would be prudent to target the spots obscured by water plants or any other shady areas. The first rule in pond fishing therefore is to approach cautiously and tread lightly; remember, all fish species can detect vibrations to varying degrees and any excessive and/or unnecessary stomping on the bank will alert them. As far as visible detection is concerned, it’s also important to try and keep a low profile as far as possible, especially during bright, sunny days when sunlight penetration is at its highest. Try and avoid showing a profile above the horizon and when moving, do it slowly and deliberately, preferably in a crouching position. Make sure your tackle and bait is rigged and ready for your first cast well before you reach the water’s edge. If you are using a fly rod, try to work out your line with the minimum of false casts to avoid spooking potential prey. Start with short casts close to the shore and when those prove to be ineffective, gradually lengthen your casts. When using a float, always try and cast your bait as close as possible to any structure (watergrass, weeds, etc.). Fish in ponds will tend to hang around here for both protection against predators as well as feeding opportunities. Obviously, a bit of a breeze ruffling the water’s surface will dramatically improve one’s chances of hooking a fish. One of the advantages of fishing in a pond, obviously, is the fact that you can cover all the potential fishing spots in a relatively short time. Therefore, make sure that you approach every potential fishing spot with caution and apply all your fishing skills to the best of your abilities. Bluegills normally will bite throughout the day, while bass tend to feed better during the dawn and dusk periods. Fly fishing for bluegills can be great fun and also a good way to hone your trout nymphing skills. You can experiment with various retrieves, from a slow steady one to a laborious figure of eight retrieve where your fly only move inches at a time. If you use bigger flies for bass, you obviously have to impart as much movement as possible to your fly and sometimes a very fast retrieve with punctuated, short pauses inbetween works best. Tilapia can be very skittish to entice to the hook and I have found the best conditions to fish for them is either when the water is a bit murky or there is a good surface chop. They are also more circumspect when nibbling on the bait (compared to bluegills) and you have to watch your float like a hawk. Make sure to strike at even the slightest bit of float movement, sometimes in a sideways direction. Whatever your fishing motives or desires, as far as I am concerned pond fishing can be lots of fun. I would even go as far as to claim that targeting specific species (or trophy fish) in ponds can be more challenging even than fishing in a conventional lake or river, due to the various unique circumstances pertaining to these bodies of water as outlined in this article. I would therefore urge any prospective angler, if he or she has access to a pond containing fish, to go out there and experience a bit of finesse fishing in a relaxing environment. Tight lines!